I think we all should just take a moment and thank Pottery Barn and Ballard Designs for all the great inspiration they give us throughout the year. Without them, half of the posts on craft blogs around the world (or maybe just America) would not exist. Thank you Pottery Barn and your wonderful internet site. Thank you Ballard Design and your catalogue thats graces me with its presence all year long. Now with that said....and this is probably a little bit obvious now....Pottery Barn has inspired me yet again. 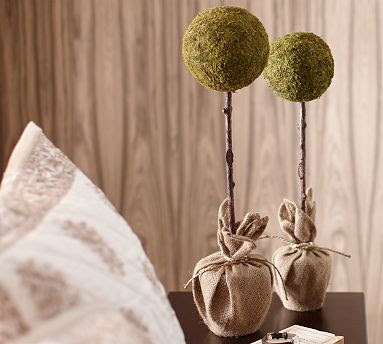 I grabbed these moss balls at a place that I like to call heaven...and my husband calls suicide....Tai Pan. I know they obviously have stores in Utah. I think they have a few in California as well. More than half of my decor around my house (thats not handmade or repurposed) more than likely came from this heaven on earth. For all you who don't live in Utah or California. I used some bamboo that I bought from Pier One like ten years ago for the 'branch'. I then spray painted them with some ORB. I then took some small planters that didn't quite turn out the way I wanted them to for a different project and filled it up with Styrofoam, poked the bamboo through the Styrofoam, then weighted it down with some rocks. Next, I took some burlap and half hazardly tied it around the bamboo. Oh, and of course, I stuck the moss ball with the top of the bamboo. After looking at my finished product, I knew I wanted it to be tall...real tall...but didn't realize how funny it would look being that tall. So I just grabbed some ribbon and tied a bow. I'm still not too sure how I like this look. Maybe it looks a little weddingish?? PS. This project was free. I had all the materials on hand already! Can't beat that.